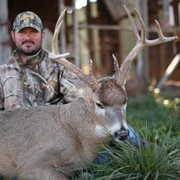 My Kansas hunt started out with an 20 hour drive out of Bozeman Montana, where I picked up GF camera man Ben Coulter. Ben and I had a pretty uneventful trip until we hit Kaycee, WY., my old hunting grounds back when I guided for 7J outfitters. 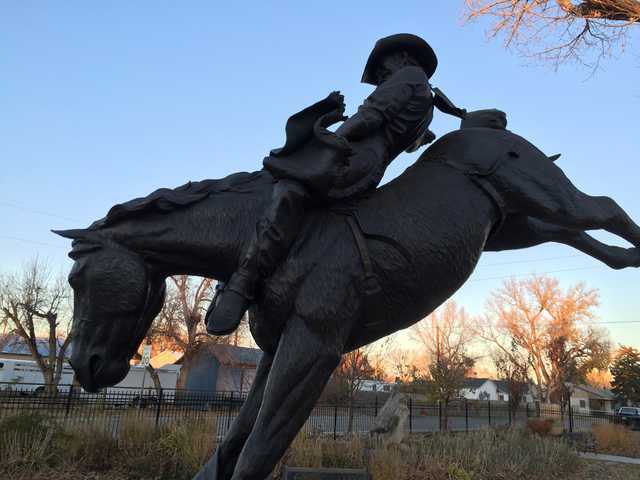 Driving thru the small town I glanced over and saw the awesome tribute to country music/ bare back legend Chris Ledoux. Pretty darn cool. This trip was starting out just right.The remainder of the drive was pretty uneventful . The following afternoon we picked up Tyler,Wade and John at the airport. We stopped at a restaurant to grab a bite to eat. 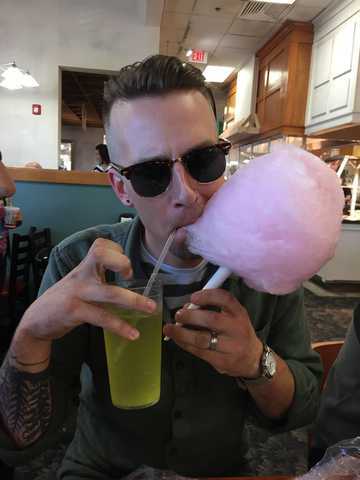 And of course Wade Freakin James has to get jacked up on cotton candy and Mt.Dew. Yes, people were staring but we've become accustomed to that when Wades around! 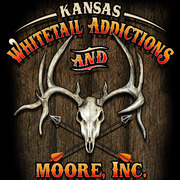 Next stop, Kansas Whitetail Addictions &Moore! Arriving at camp we met owner Jacob Moore and his dad Trent. Jacob would be our guide at the south camp while Trent ran the north camp. Steve and Jim were already in camp as well. I have had the good fortune to hunt with Steve and Jim before and looking forward to it on this trip too. Getting the truck unloaded and bow shot was the next step on the list of things to do. The weather was changing and the excitement was building! 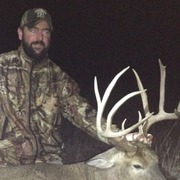 South East Kansas = big whitetails! I've finally got a tag in my pocket and a great place to hunt , with good people in camp. Can't wait to get this thing started! Jacob wanted to show me where I'd be hunting in the morning so I could drive myself, as it was a 20 minute drive. Jacob kept telling me about this spot on the way out, he was saying don't laugh and trust me, over and over again. I was thinking the whole time , great I'm gonna be garr holed from the get go! 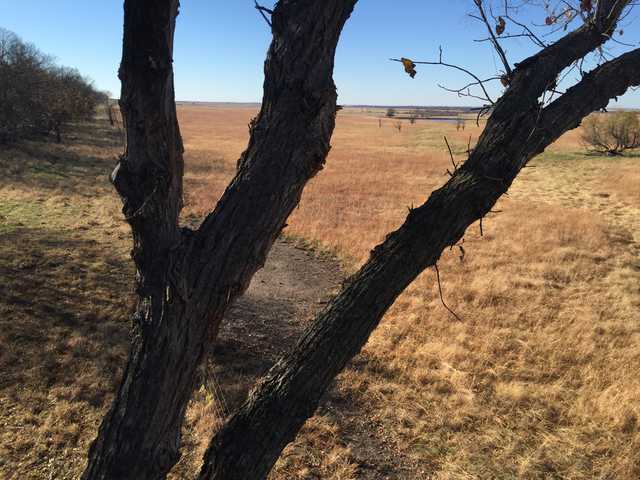 Turns out my stand was in the one And only tree that was big enough to hold a stand,amongst hundreds of acres of CRP. I would literally be able to see for miles. If deer are cruising I will defInantly be able to see them. We drove back to camp, ate supper and looked at trail cam pics. The bucks are here, now in the next 6 days can we get one in bow range? On the first morning,Wade and I headed in at daylight. The idea was to still hunt to the stand so we wouldn't bump deer in the dark. It was a good thing we waited. We were into deer from the start,we finally made it to the stand at 8. We saw 12 deer from the stand but no mature bucks. Around 11:30 we headed back to camp for lunch and a nap. We were back in the stand at 2:30. The deer started moving at 4 o clock. 10 does and a 2 yr old 8pt came in. Wind was blowing 15-20mph. Temps were in the 60's .Pretty good day. Day 2. 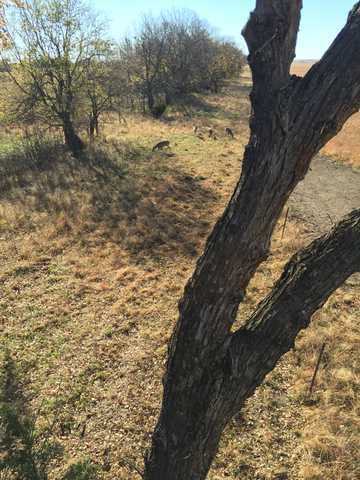 It's November 9th and the warm temps are keeping deer movement down. The deer we saw moved at daylight and dark. Everyone in camp experienced the same kinda of movement today.The weather change I mentioned earlier is suppose to happen overnight. Tomorrow could be the day. Day 3. The temps dropped to 28 degrees. I couldn't wait to get back in the stand. 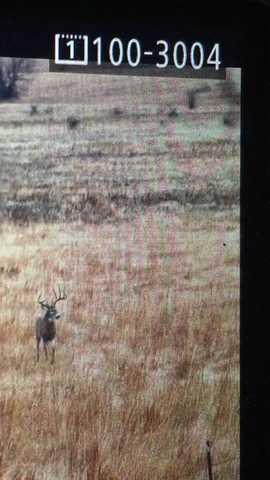 November 10th is gonna be the day I shoot the giant I have waited my entire life for! Ok, so it didn't happen. But I did see three bucks over 150. They chased does out in the broom grass until 10:30.It was an exciting morning to say the least. Part of my goal going to Kansas was to see big bucks chasing like that.Nothing came close but one thing is now proven, all the trail cam pics Jacob showed us are real, big bucks do exist on his farms! After a quick lunch, Wade & I headed to a ground blind for our evening sit. The wind had changed direction and those cool temps from the morning are long gone. It was a long ,comical , smelly sit. One things for sure,Wade and bake beans don't go well together! Finally after legal shooting time ended,my Zeiss binos revealed 4 does moving up through the drawl.We waited for them to pass by , then we headed out. Arriving back at camp, we learned Steve had shot a buck right before dark. Unsure about where the arrow hit,Jacob decided to wait until morning to go look for him. That evening we ate another great supper. Afterwards we were all looking at the mounts hanging in the living room, when Jim commented about the crappy workmanship of the mounts. Jacob laughed a little , unbeknownst to Jim, the taxidermist who did the crappy work was sitting at the kitchen table getting more irritated by the second.He exploded out of kitchen swinging a right hook toward Jim but Jim ducked and his swing caught Steve in the shoulder.Steve then shattered Benners nose. The cameramen jumped up to start filming the brawl. Jacob got himself in the middle of it trying to break the whole thing up,he to took one to the face...Ok so none of that ever happened but the red in Benners face said it might! The real story is we all knew Benner was the taxidermist and we're playing A lil joke on him because one of the mounts had cracked around the mouth ,due to being hauled around to shows by Jacob for advertising . Benner does outstanding work and a few minutes later the joke was over but we all had a few good laughs. Now , back to the hunt. Day 4 found us in a different set. We saw a couple small bucks as well as a few does. The best part of the sit was getting to see the bobcat that came slipping by. Even in Kansas you can have slow, Uneventful days. But , wait there is some good news, they found Steves buck! Steve with his 140 9pt. Steve and Jacob found the buck the following morning aided by Pepper, Jacobs dog. Day5 was not a day to be in a tree . Winds blew 60-70mph. No one in our camp hunted but the guys at north camp did. They had no luck. We ate supper that night with the north camp. Great food again. Day 6 started out promising. We set up on a buck as we headed to our stand. I was ready, Wade was on him with the camera but he shrunk the closer he got. Turned out to be a 110 8 pt. After getting in the stand we spotted two of the big bucks we had seen previously.Problem though, they're half mile away chasing does. One of'em is a dang good one. Hoping and praying didn't bring him any closer either. We headed for lunch at 11. Wade wishing he had a bigger lens when that big buck was running does. This is it. Last evening. We got a good wind and there's big bucks in the vicinity . We had 10 does and fawns come by at 20yards. 2 bucks wandered by in shooting range but we're not what I was looking for. Right at dark 2 shooters showed themselves to our southwest but never ventured close enough. This story should end right here but it doesn't. Jacob encouraged me to stay and hunt since he had a spot open. Wades plane doesn't fly out until 2 pm. We are gonna get aggressive in the morning with the 3 hours that have been gifted to us. Day7- In the pre-dawn darkness Wade and I slip in the old road bed that we've been hunting all week. 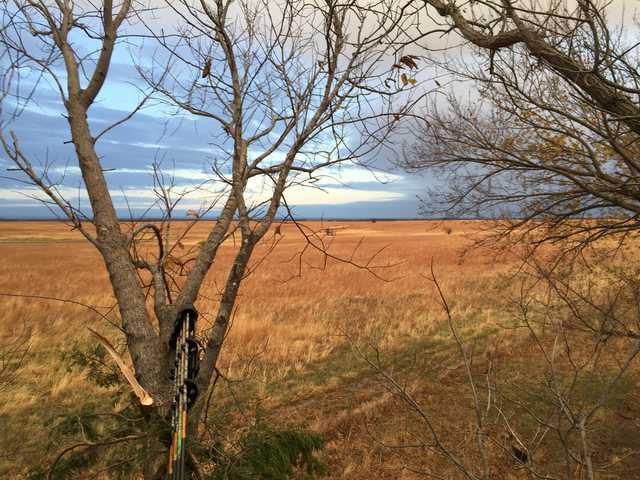 Glassing as we go, we spot several deer in the CRP. We get to the stand and keep on moving past, we are gonna try setting up on the ground right were 4 properties come together. All the big buck activity has been near this corner, prayin it will be this morning too. Arriving at the corner we look the situation over, Jacob is right, there's hardly any cover. One cedar tree and one scrub tree 25 yards up further. We set up near the cedar and start glassing. He's there,just 400 yds to the south. 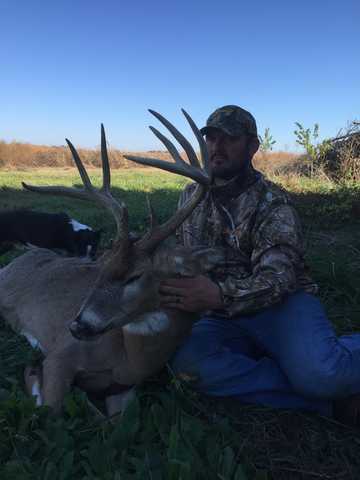 Big mature 9 pt with 13 inch tines. He is trying to keep his doe from going to the west. She's really wanting to get to that western draw but he wants no parts of it. I tell Wade if they don't go that way, they're coming up here. I gave him my bleat call and rattle bag, I moved Up to the last piece of cover which put me 45 yds from the property line. Within minutes they were heading our way. The doe jumped one fence going east then another to the north. I can see the buck coming, I draw my bow and get ready. He trots by at 50 yards , following her trail across the east fence. I glance at the doe, she is standing 30 yards away on our property. I'm about to get the shot I've waited a... Noooo! He loses her trail and keeps goin east. I'm whisper yelling to Wade to bleat. At that the big buck puts on the breaks, turns around and starts coming back. 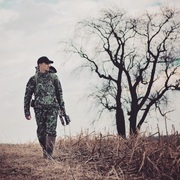 He spots another doe to the west and focuses on her. More wHisper yelling to Wade,RATTLE! He does and it works, the Bucks ears are pinned back and he's headed to the fence. I'm about to get the shot I've waited..Noooo! The original doe bolts to the east before he crosses the fence. Seeing this, he to heads east. It's over. So close. Wade and I talk a few minutes, he may be more excited then me. After a couple more minutes , my adrenaline laced head stops pounding and we review the footage. It's spectacular. The deer, the colors, everything is perfect. Wade did a heck of job. I just didn't get him killed. As awesome an experience you can get but so disappointing at the same time. Heading back to camp so Wade can pack , I call Jacob . The disappointment in his voice comes thru the phone. All his work and nothing to show for it. I feel worse for him then I do for me. Jacob talks me into staying a few more days. InitialIy I'm against it. 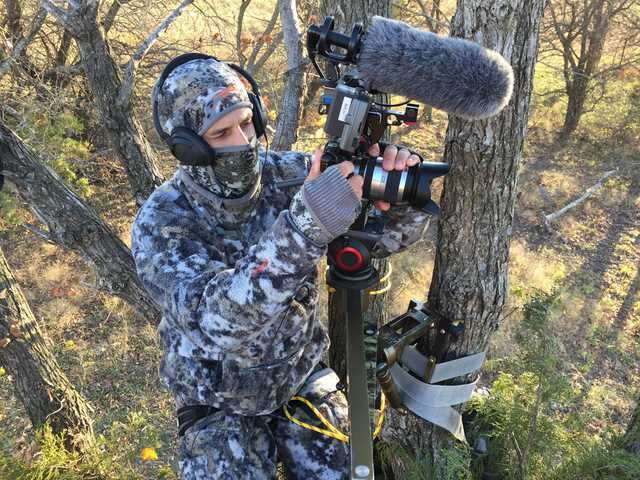 Filming our show is about the reality of hunting. A lot times things don't go right despite what a lot of other tv shows release. To many people going on hunting trips have the wrong expectations due to this. I want them to see the disappointment and satisfaction , even though nothing died. But I will stay and explain the circumstances . I will self-film or I guess I should say ,try to self film. I rush Wade and Tyler to the airport, grab a Sandwhich at McDs and race back. Jacob and I have got a stand to hang in a certain scrubby tree where 4 fences come together. 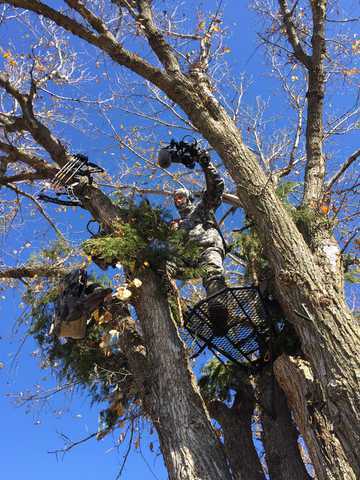 Jacob hangs two stands in case he can film one morning. We trim a few branches and get the heck outta there before deer start moving. We had driven maybe 100yds from the stand, when the Right front tIre blows. You have got to be kidding me! AtLeast it's not raining. The next morning I don't hunt because the wind is wrong. 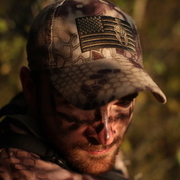 AT noon the wind shifts and I climb into my stand. I seen A doe at 3:30, nothing else stirs. Benner had a giant at 20 couple yards but didn't get a shot. Day 9 is more of the same. Warm,rainy weather with wind blowing 20 mph. I'm starting to hate Kansas. It's November, it should be 30 degrees not 60. I again see one doe. Day 10: I wake up to rain pouring down, too much to take the camera out. I check the weather and see it will clear up 8. At 8 o'clock I'm sitting in the stand and it's pouring . Radar is showing the rain producing cloud is only in my area. Go figure. Then the Lightning starts. Im getting down, screw this. As I pack up, it stops raining. No more lightning. Maybe all is good now,I get set back up. I look to the north and see a 2 yr old moving past my original stand. Great there's deer moving! Glance to the west and another 2yr old ! I think how great it would be to see the giant 9 start coming from the south. I look that way and he appears, half mile out coming at a trot. I turn the camera on and try to get him in focus. I start ranging clumps of grass and fence posts.When he's at 200 yards I grab my bow, this is it, Focus ,stay calm. At 100 yards I realize I'm not going to be able to film the shot, I can't get the camera around the tree. Too bad, I'm shooting anyhow. He jumps the fence. I come to full draw knowing my shots going to be 40-43 yards. As he walks into my shooting lane I bury my 40 pin low behind his shoulder. Blahhat! I trip the trigger. Everything is in slow motion . The buck is ducking and turning as my Ramcat parts the hair on his back. I watch him run the half mile back to where he came from . Im sick. Throwing up sick. How did that just go so wrong? 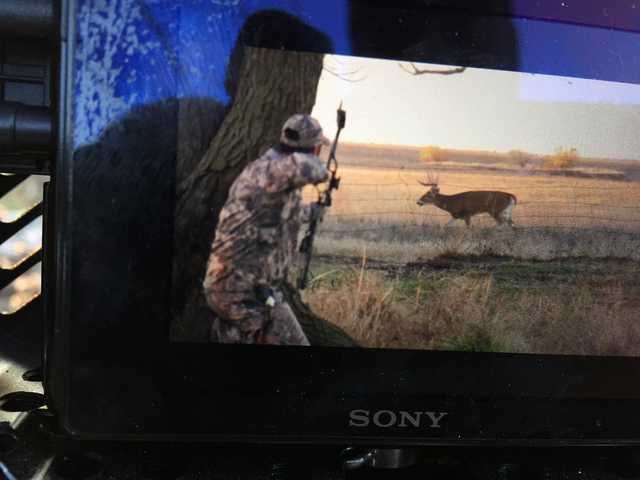 I've waited my entire lifetime for that shot, passed up hundreds of smaller bucks waiting for that one opportunity and I blew it. I wanted to cry. I wanted the shot back. I didn't want to tell Jacob. The walk back to the truck was the longest walk. My head pounded, my stomach churned. Please let me wake up from this dream turned nightmare. But it's real, the buck, the shot, all of it . I call Jacob and tell him the bad news. The frustration is evident in his voice. Again, his hard work was for nothing. Dang it man, I hate this! Jacob handled it like any good outfitter should, telling me crap happens and so on.Ive been in his shoes dozens of times as a guide but never on this end.Its a different feeling that's for sure. To think a deer can cause so much drama and heartache is kinda foolish but they do. 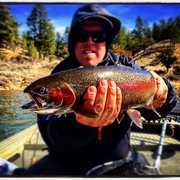 Long live the desire and adrenaline rush that come with those all to uncommon occurrences . That deer lives to maybe fulfill another hunters dream or become his worst nightmare. 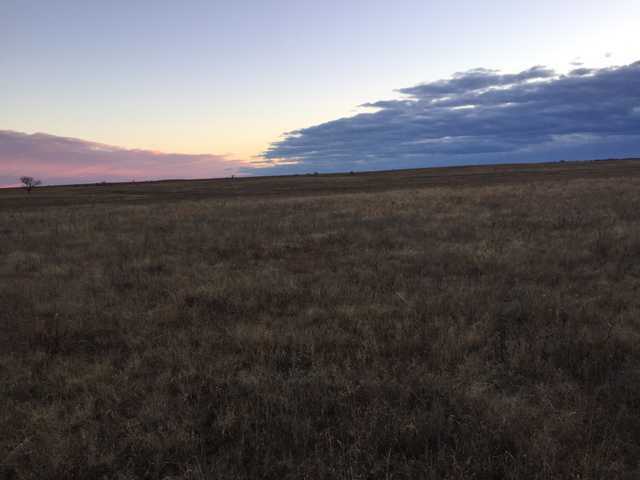 Either way he's still out there roaming the Kansas prairie . Getting ready to grow a set of horns even bigger then last year. As for me, I ve played that shot over and over in my head. If I only woulda... You get the picture. It's March and that still haunts me. Oh crap, it's March, gotta get ahold of Jacob, Kansas license applications are coming up! You know It's always been a dream of mine to hunt Kansas, hopefully this time the rest of my dream comes true! What shoulda been The Miller buck just before the shot. Well, as wild as this story is its all very true. Lenny it's just part of being a hunter! We sit all of those hours for the "opportunity"... And in my shoes it's just part of being a outfitter or guide, as you well know! It's what we live for no matter if we fill our tag or not. One thing is for sure, November will be here before we know it and we can try it again!